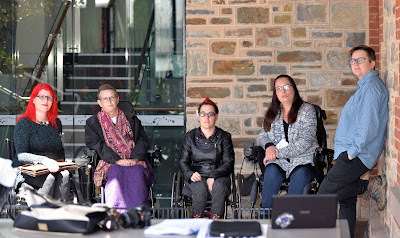 This week, disability advocates were horrified to discover that the Newcastle Greens, together with the NSW Nurses and Midwives Association, were advocating against the closure of institutions. That’s right. One of the last states in Australia to stop breaching our international human rights obligations, NSW, have made a commitment to close the last of the old ‘congregate accommodation facilities’ – including Stockton Centre, an institution for the intellectually disabled in the Hunter Valley. And some ‘stakeholders’ don’t want that to happen. There are a lot of stakeholders. ‘It’s their home!’ the parents cry. ‘My child has lived there for forty years!’ They’re stakeholders who are bound not just by love and fear, but by exhaustion and guilt. They’ve worked their whole lives to find the best possible solution for their child, who now knows nothing else. The prospect of the unknown is terrifying, despite the experiences of others who have successfully transitioned into the community. ‘But that’s my job!’ say the nurses, who have banded together with the parents. They’ve built a career in these institutions, and they’re not going to let it go lightly. They say they’re arguing for the rights of disabled people, but that’s like saying that the Farmer’s Federation should argue for the rights of nurses. ‘It’s about privatisation!’ shout the politicians, dismissing the fact that the decision to devolve institutions in NSW was made in 1998, when the NSW government announced that all residential centres accommodating people with disability would close by 2010. At the time of the announcement, more than 2,000 people lived in large institutions. It’s about devolution, not privatisation. And there’s a lot of chatter about the convenience of having collocated medical and specialist services, without a mention of the ‘f’ word – funding. Keeping people locked away together saves the government a lot of money. But what of the voices of the people who are shut away from the world? The voice of people with disability? It’s almost like they are ghosts. Like in that movie, The Others. Benign poltergeists who do not even know they are ghosts. Invisible to the rest of the world but for a shadow here, a soft knocking there. You can hear their voices in the stories, but you need to listen carefully, look hard. ‘BELMONT North woman Wendy Cuneo says she and other Stockton Centre parents are alarmed at any idea of the institution closing. Mrs Cuneo and her husband Clem have three children with disabilities, including David, 34, who has been at Stockton since the age of 18. 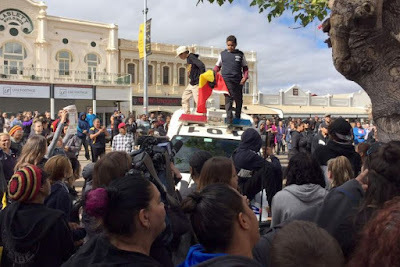 When the Newcastle Herald met the pair in Mayfield yesterday, David was adamant he wanted to move away from Stockton. But Mrs Cuneo says experience tells her that a large, protected space like Stockton is the very best of addresses for her son. I can hear David’s voice. From a Facebook post about a man who moved from Stockton Centre to a group home. "The final day came when R was to leave. They just didn’t ever understand how to understand about R and they were always trying to force R to do things. You cannot force R to do anything. He has to do it…. When we made the decision about trying to get him into the house... I told him about it…and R’s never been an easy person to take into a new situation, he’s always baulked at it. So I talked to him about it and then arranged to make a visit to the house before he actually moved in, and I think they had some kind of welcoming party. We went up to the house and he didn’t hesitate. I said it was going to be his own home. He walked up the steps, into the house, he walked down the corridor to the back room and joined the party. And then of course when he moved in we showed him where his bedroom was and there was absolutely no question that he understood this was his home. So what’s going on in his mind – the difference between that environment and those awful places is just so amazing. Well, he was treated more as a person…The other things that happened – he suddenly – like you blow up a balloon and it fills with air and it becomes tauter and firmer? Well that’s what happened to R within himself. There was more of him somehow." I can see R, shedding off his invisibility, gaining in solidity and presence, becoming more real. Those stakeholders – those people with a vested interest in the outcome –they’re easy to see, aren’t they? They’re present, on social media and in the newspapers and in Parliament with their speeches and placards and heartwrenching stories. It’s harder to see the Others, let alone hear their voices. That’s because we have created a system of disability apartheid where people are routinely segregated and isolated in order to get the support that they need, where their human rights are denied every day. You can hear their voices here, at the Shut In campaign site, where people like Jan Daisley talk about their experiences inside institutions. You can hear their voices here, in the UN Convention on the Rights of Persons with Disability, which talks about the right to be fully included and to live in the community with choices equal to others. We need to close the institutions now and make sure people with disability have enough support to live where ever they choose – not in an institution, a hospital, a jail or a ‘facility’. Listen carefully, look hard. It’s only then that people with disability living in institutions will stop being ‘the Others’ and start being ‘all of us’.